Today I thought I'd go the This or That Tag so you guys can get to know me more - especially if you're new! 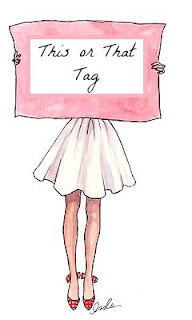 I love doing tag posts, you can read some of my previous here, here & here so if you fancy doing this one make sure your share your posts below in the comments!! I'm definitely a bronzer girl, I hardly ever bother with blusher! Definitely Lipstick - I hate how sticky lip gloss is, it just gets on my hair all the time!! 100% mascara, I don't wear eyeliner a lot because I still haven't mastered the wing'd look - if you have any tips, please share them below! Foundation because you can build it up on problem areas. Long, I hate short nails!! I love wearing acrylics because they give my nails length and I feel more girly with acrylics. Bright in the Summer and Dark in the Winter!! Body lotion or Body Butter? Body wash - I love Soap and Glory!! LUSH or Other Bath Companies? Jeans in public, sweatpants at home! Long or Short sleeved tops? It depends on the situation and also the season! Scarves! I don't really like hats! Necklaces, although I've been looking for some nice dainty bracelets for ages! Jackets but I love wearing my Boyfriends Hoodies in the house when I'm chilling! My hair is naturally straight, and I would say I definitely wear it straight more often - but I prefer it curly! I love a messy bun! Definitely bobby pins - but I ALWAYS loose them. Like seriously, where the hell do they go? I love and miss my long hair so so much! I cut my hair fairly short not too long ago because my hair wasn't in the greatest condition and I just fancied a change, but now I want my long hair back!! In between!! I have like a lightish brown colour with ginger tints! Side sweep or full on bangs (fringe)? Side sweep, full fringes don't really suit me they make me look too young! I love summer and hot weather, but tbh in England we rarely get a summer. I love cosy winter nights in cuddling up with a hot chocolate by the fire. That's a tough one! That's all the questions! Thanks for reading!